Size:1.49x0.3m(54"x12"). Features:Air Release,Heat Resist,waterproof. Life:(based on verticalsurface exposure)6-8 years. That would be the best honor for us. Color: Black. Size:60" x 11.81" (152cm x 30cm). That would be the best honor for us. Vlevet car wrap film. Waterproof and durable--Exterior or Interior Use. 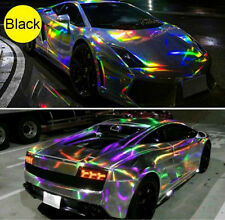 Quality Tint Film for vehicle lights protection, suitable for cars, for vans, motorcycles, etc. Smooth surface and with self-adhesive. Color : Lake Blue. Very easily cut - scissors will slide right through. Air pocket release backing design so there are no bubbles. The ultimate in flexibility. Water proof. Will not harm your paint or natural finish - no residual glue once removed. Size:60" x 11.81"(152cm x 30cm). That would be the best honor for us. Texture:Glossy wrapp film. Air Release. Air-Channel Release Tech. Area of use (based on vertical surface exposure) 6years. Conformity and stretch up to 200% (30% or less is suggested for optimal performance. ). » Very flexible wrap vinyl when heat is applied. Use a hair dryer or heat gun to shape the film. A squeegee may help to make the surface smoother. Cut the unwanted film by knife. Clean the surface you are going to operate, make it clean and dry. Can also be used with a heat gun or household blow drier for shaping. Self adhesive. Features:Air Release,Heat Resist,waterproof. Material Type:PVC Vinyl. Will not harm your paint or natural finish. Low cost compared to a paint job! Size:60" x 20"(152cm x 50cm). Make sure where you need to stick it. In general, slowly stick on one side, while using tools to flatten, while uncovering the paper. But not to cause accidental adhesions. Help to hide existing scratches and protect the surface you are going to apply. 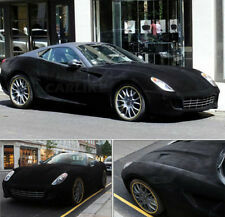 - This material can be used on itnerior or exterior of vehicle wrap. Color: yellow. - Help keep higher resale values / lower end of lease fees. KR7095: VLT: 70% (Visual Light Transmission); UV Rej: 99%(Ultraviolet Rejection) Application: car / bedroom / balcony / kitchen / office / sliding door / warehouse / bathroom, toilet, and other smooth surface. Car film:0.12-0.13mm thickness. Materials:High clear PET film. Use for:Car front or side window. Heat rejection:80%. That would be the best honor for us. Light transmittance:70%. That would be the best honor for us. Size:58.66" x 39.37"(149cm x 100cm). Size: 60"x78.74"(152cm x 200cm). smooth surface. It will wrap dash parts, mirrors, trim, or the whole exterior of the. - Highly flexible PVC film,nondiscolouring when stretching. - Have air release,do not keep bubble. While using tools to flatten, while uncovering the paper. Feature:Self-adhesive,Anti-Scratch,Extendable,Air Bubble Free(don't wash the. Do not let the sticker and the Car body have any separation or protuberance. ). Feature :Self adhesive. Color:As picture show. That would be the best honor for us. Size:50" x 118.11" (124cm x 300cm). Can also be used with a heat gun or household blow drier for shaping. Size:20" x 53"(50cm x 135cm). Features:Air Release,Heat Resist,waterproof. Self adhesive. Will not harm your paint or natural finish. Adhesive: Acrylic-based, reposition able, slide-able. Texture: Brushed. Thickness: 3.9 mils. Life: (based on vertical surface exposure) 5-7 years. Size: 20" x 60"(50cm x 152cm). Color :Black. That would be the best honor for us. Dry Glue Heat Technology. Air bubble free. Color: Silver Size: 50cm x 152cm(20"x60"). Easy removal with no glue left behind. 2 x Layers (Paper backing). That would be the best honor for us. Can also be used with a heat gun or household blow drier for shaping. Features:Air Release,Heat Resist,waterproof. Material Type:PVC Vinyl. Will not harm your paint or natural finish. As far as we can do, we will declare the goods and the amount as appropriate. Help to hide existing scratches and protect the surface you are going to apply. - This material can be used on itnerior or exterior of vehicle wrap. - Flexible and durable - Bond to flat or curves surface on you (applied with heat). Need sharp utility or xacto style knife,squeegee, blow dryer, or heat gun to. Cleaning the surface with rubbing alcohol prior to installing the vinyl will help with adhesion and clean any contaminants that may cause imperfections. Feature:Change Car Apperance. That would be the best honor for us. Size:60" x 20"(152cm x 50cm). Can also be used with a heat gun or household blow drier for shaping. Water proof and stain resistant. Self adhesive. Will not harm your paint or natural finish. Indoor life of over 8 years. Outdoor life of over 5 years. Features: Anti UV, Heat Resist, waterproof. Thickness:2 mil Type: Nano Ceramic film. Life: (based on vertical surface exposure) 10 years. Product picture s That would be the best honor for us. Application: Can be applied on interior and exterior surfaces of a car bonnet. Function:Water proof, UV ; Filter harmful light ray. Seamless for whole car wrapping. Size: 20" x 53" (50cm x 135cm). Color:R ainbow W hite. That would be the best honor for us. Rip away the film and spray water on it. Suitable for any headlights, fog lights, side marker lights, tail lights, etc Easy to handle and install. Use a art knife to cut the rest film. Feature:Change Car Lamp Color,Water-proof,Anti-scratch. Application:Die cutting Car decoration. That would be the best honor for us. Can also be used with a heat gun or household blow drier for shaping. Features:Air Release,Heat Resist,waterproof. Self adhesive. Low cost compared to a paint job! Material Type:PVC Vinyl. Will not harm your paint or natural finish. Self adhesive. Features:Air Release,Heat Resist,waterproof. Material Type:PVC Vinyl. As far as we can do, we will declare the goods and the amount as appropriate. Life:(based on verticalsurface exposure)6-8 years. Adhesive: Acrylic-based, reposition able, slide-able. Texture: Brushed. Thickness: 3.9 mils. Life: (based on vertical surface exposure) 5-7 years. Color :Black. That would be the best honor for us. Size:60" x 40" (152cm x 100cm). That would be the best honor for us. Size:60"x20"(152cm x 50cm). Car film: 0.12-0.13mm thickness. Materials:High clear PET film. Use for:side and behind window. That would be the best honor for us. Adhesive: Reveable adhesive. Spoiler, bumper, car roof, car mirror, interior decoration and so. Function: Water- proof, UV Filter harmful light ray. Type:Glossy Color:Black. Application: Can be applied on interior and exterior surfaces of a car bonnet.